Hey, Kotaku readers. It's been about a year since I took the reins of Kotaku and just about a year since we brought in a lot of fresh faces. Much has changed. Much has not. I figure now is as good a time as any to hear from you fine readers about what you're liking and what you're not. For the next hour or so, I'll answer any questions you ask below this post. Ask easy questions. Ask tough ones! It's all welcome. We've had a good year. Good stories. Good exclusives. Good features. Good videos. I'm very proud of our team. For those looking at this note as perhaps a State of Kotaku, I'd like you to know that the State of Kotaku is strong! We are an ever-evolving and, I think, an ever-improving site. We're not perfect. Sometimes we err (and ideally we always correct). But we had a hell of a 2012. Hopefully you caught our best stories of last year. Before you start asking questions, I do want to note something that I could have sworn we've said, but that I think some Kotaku readers and non-readers miss. I'm going to bold it so it sticks out! Kotaku is a news and opinion site about video games and the culture around them. Yes, that's a bit broad. And yes, yes, that's different than most other gaming news sites. It's even broader than the 100%-gaming approach Kotaku originally had. In years past we've dabbled with covering science, reviewing movies and writing about comics, among other things. We've assumed that the things that interest our team will interest many of you and that much of what we care about does not fly far from the orbit of video games. Gaming is our first love. Admittedly, sometimes we've rocketed a little more out of orbit than need be, but I feel our current mix not only helps make us unique but gives you, the readers, a lot of variety and some pleasant surprises. We don't want to bore you and we prefer to push things. If we slip up, it probably won't be for being too conservative. We love covering games. Gaming will always come first at Kotaku. The site, of course, has always been about more than just the product of video games. It's been about the people and the culture, the game-makers and the game-players. We also figure that if all of us are talking about a TV show, we should share that with you. If there's a pocket of culture we're fascinated by, we want to let you in on it. It's part of how our parent company, Gawker Media, works. Don't settle for fake news. Don't settle for what's banal or what some PR person said was the news of the day. If we miss a key story, figure out what fresh take we can have on it. Strike the balance between informing you about what's going on in and around gaming with spending our team's efforts on stories worth your time (hence both the new showcasing of our longreads and the increased number of very short 120-character posts; you don't always need our take when a link to some great article elsewhere will do). What's an ideal Kotaku? I'd say a week like we had last week fits the bill. Tons of stories. Tons of great visuals. Breaking news. A moving account of the life of one gamer. An investigation into the most controversial thing about video games. A story about Doom that you'd never expect. And having John Carmack weigh in on it in the comments. We have some exciting months ahead. The next few months will see the release of some fascinating games, big and small, from Grand Theft Auto V to Antichamber, from BioShock Infinite to Skulls of the Shogun. We'll certainly hear official word about the next Xbox and PlayStation. PC and mobile gaming will continue to fascinate, as will the everyday stories of everyday gamers, whose experiences with gaming vis a vis relationships, mental illness, and other parts of real life we'll continue to feature on this site. And just when you least expect it, we're hoping to radically improve the tech behind this site, too. Cross those fingers! Kotaku readers have been wonderfully supportive for the past year—hell, for the past eight years! We aim to work ever harder for you and appreciate all your feedback, pro and con. So... ask me some questions below. UPDATE: Q&A's over. Thanks for the avalanche of questions, everyone! I answered as many as I could. 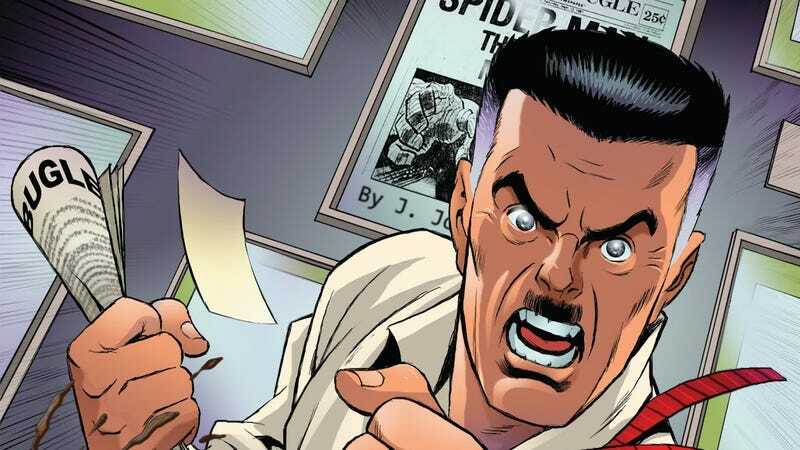 Top image of J. Jonah Jameson is from the packaging for this statue of the best editor Spider-Man has ever had.